The Splatfest Tee is clothing in Splatoon and Splatoon 2. In Splatoon, it is a 3-star item produced by SquidForce and comes with the primary ability Special Saver. It is only available between the announcement and conclusion of a Splatfest, and requires the players to pick a side in the Splatfest. In Splatoon 2, it is a 3-star item produced by SquidForce and comes with the primary ability Ability Doubler. It is only available between the announcement and conclusion of a Splatfest, and requires the players to pick a side in the Splatfest. It cannot be ordered through Murch. The Splatfest Tee takes on a variety of appearances depending on the Splatfest for which it is worn and the team the wearer is on. Its UI icon uses a default design that is also applied when viewing players in the Plaza or in Inkopolis Square for a Splatfest in another region or after a Splatfest has ended. Its basic structure is always the same: a short-sleeved shirt that is primarily one solid color with an illustration of the wearer's chosen team on both the front and back, accompanied by a light-colored plastic wristband worn on the right wrist. On the wristband is the SquidForce logo in white, and at the left side of the hem is a small white tag with the same logo in black. On the upper back of the shirt is SquidForce's name in white Inkling text, which glows in the dark in Splatoon 2. The wristband changes color to match that of the wearer's ink, allowing it to be a different color from the Tee when worn prior to a Splatfest. If matched with a player using a copy of the game from another region where a Splatfest is upcoming, and that player is wearing the Splatfest Tee. 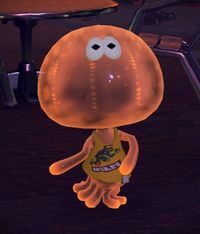 It is also possible to see this during the other player's Splatfest if they are joined in Salmon Run, as their Inkling will appear near the Grizzco Industries entrance. 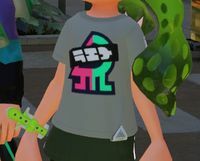 After a Splatfest, any Inklings seen in The Square or Plaza who have not played since the end of the Splatfest will wear the default Splatfest Tee. The wristband for the generic Splatfest Tee has no set color, and will always roughly match that of the wearer's ink. The Splatfest Tee comes with Special Saver as a main ability. As a 3-star item, the Splatfest Tee has three additional slots for secondary abilities. Since it is made by the SquidForce brand, it has a higher chance of rolling Damage Up and a lower chance of rolling Ink Saver (Main) to fill its secondary ability slots. The Splatfest Tee comes with Ability Doubler as a main ability, which, being exclusive to the main slot of Clothing, prevents the wearer from also having Haunt, Ninja Squid, Respawn Punisher, or Thermal Ink. As a 3-star item, the Splatfest Tee has three additional slots for secondary abilities. Since it is made by the SquidForce brand, it has a higher chance of rolling Ink Resistance Up and a lower chance of rolling Ink Saver (Main) to fill its secondary ability slots. Upon choosing a team at the Pledge Box in Inkopolis Plaza or Inkopolis Square, the Splatfest Tee is automatically put into the player's inventory. On the days leading up to the Splatfest, it can be equipped and unequipped at will, but it is automatically worn for the duration of the Splatfest itself, and cannot be switched out during that time. Jelonzo would comment on this in Splatoon, informing the player that they could not equip any new clothing bought; Jelfonzo does the same in Splatoon 2. Once the Splatfest ends, the Splatfest Tee is removed from the player's inventory; when the player returns to Inkopolis Plaza or Inkopolis Square at the end of Splatfest or upon starting the game, they will automatically wear the Basic Tee. Because of this, having Spyke or Murch re-roll its abilities is not recommended. In Splatoon 2, scrubbing the Splatfest Tee with Murch costs only 2,000 rather than the standard 20,000, making it an effective way to build up ability chunks quickly. As of version 4.0.0 the Splatfest Tee will continue to gain experience after filling all 3 slots, awarding a random ability chunk every 7500 points. A jellyfish in Splatoon 2 wearing a sleeveless Splatfest Tee. Variants of the Splatfest Tees worn for the Japanese Splatfest, Mountain Food vs. Sea Food, were available for purchase in real life from online magazine Clip!SAGA, as Saga Prefecture collaborated with Splatoon. Splatfest Tees for the Sanrio-sponsored Japanese Splatfests are also available for purchase in real life, featuring Hello Kitty, Cinnamoroll, My Melody, and Pompompurin. Europe and Oceania's Cats vs. Dogs Tees had the same designs as the North American ones. Japan has used Red Fox vs. Green Tanuki twice, with the same Tees in both instances. In Splatoon, the logo on the default Splatfest Tee is similar to the Squid Sisters' outfits. In Splatoon 2, the default logo is an icon representing Pearl and Marina, with Inkling text resembling the Japanese word "fesu" (フェス), short for "festival". The wristband glows in the dark. In Splatoon, this could only be seen during Splatfests themselves, as they took place at night. In Splatoon 2, the glow can also be seen during the day if the wearer is in the shade. When an amiibo is used in Splatoon 2 to save a gear loadout that includes the Splatfest Tee, it will be replaced by the Basic Tee once that Splatfest Tee is no longer available. This is because the Basic Tee is the only piece of clothing that every player is guaranteed to own. If the player's avatar is an Octoling when doing this, it will instead switch to the Fresh Octo Tee, for the same reason. In Splatoon 2, Splatfest Tees originally needed 4,000, 8,000, and 12,000 experience points to level through the three slots, for a total of 24,000. However, some players were scrubbing only after filling the first slot, getting a new chunk every 4,000 XP. To encourage full slot leveling, this was changed in Version 1.3.0 to three equal tiers of 7,500 each, for a total of 22,500. In Splatoon 2, jellyfish have a sleeveless version of the Splatfest Tee in addition to the original style. According to The Art of Splatoon the Splatfest Tees are government funded, since Inklings tend to donate coins as they don't want to deal with the leftover change. The Splatfest Tees for the Squid vs Octopus Splatfest feature writing that is similar to the kanji for squid (烏賊) and octopus (蛸), despite the fact that in-game, the terms "squid" and "octopus" when referring to Inklings and Octolings are written in katakana (イカ and タコ, respectively). This could be due to the fact that the Splatfest was referencing to "ancient creatures" (with squids and octopuses now evolved into Inklings and Octolings) as seen in the opening dialogue. For more, see Splatfest team tees from Splatoon or see Splatfest articles. Inklings wearing the default Splatfest Tee, having not started the game since taking part in a Splatfest. The wristband worn with the Splatfest Tee. For more, see Splatfest team tees from Splatoon 2 or see Splatfest articles. Three Inklings sporting the generic Splatfest Tee design. Note how the wristbands match each Inkling's ink color. Closeup of the generic shirt design. Back view of the generic shirt design. The SquidForce name on the back of the Splatfest Tee glows in the dark in Splatoon 2. The short-sleeved style for jellyfish. The sleeveless style for jellyfish. This page was last edited on 7 March 2019, at 13:26.